With iPhones in our pockets and Instagram at our fingertips, it seems that almost everybody these days is a photographer. While snapshots and selfies might be ubiquitous now, in the early days of photography, not everyone was thrilled with the portrait process, due in large part to the amount of discomfort caused by sitting perfectly still for long periods of time. These cartoons from the 1800s poked fun at the new craze. 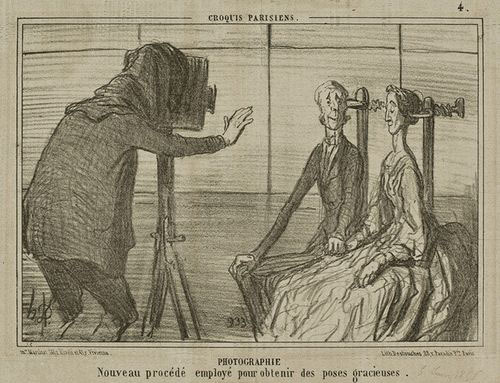 Many portrait artists were concerned that photographers would ruin their livelihood, as shown in this 1843 cartoon by Theodor Hosemann. A cartoon published in Punch’s Almanack from 1855 shows a family posing for a daguerreotype. Unable to hold still long enough, the photograph presents the family as horribly disfigured. Joking about the unpleasant expressions people made in early photographs, this 1859 cartoon shows a photographer pointing to a violent painting to inspire a pleasant facial expression from his sitter. Not much has changed in our society’s need to photograph our children since this 1876 cartoon by George du Maurier.